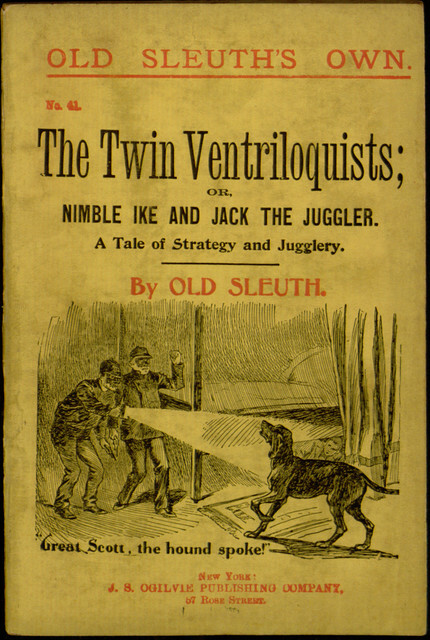 Our latest proofreading project is a dime novel from the Old Sleuth’s Own series: The Twin Ventriloquists; or, Nimble Ike and Jack the Juggler: A Tale of Strategy and Jugglery. The dime novel era was rich with detectives, and this book gives a taste of what early popular mysteries were like. It was common then, as now, for characters to recur in series of stories, and both Nimble Ike and Jack the Juggler have further adventures in other volumes. Perhaps some of those tales will cross our path sooner or later!